SciTeeX introduces its new Cabilux Zirblast series. 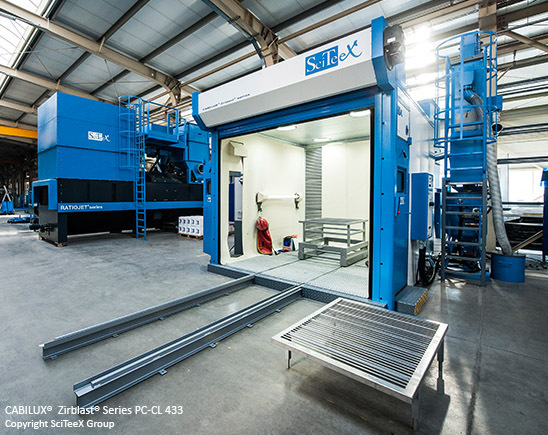 This new range of pneumatic blasting rooms are designed for optimum process performance with the Saint-Gobain ZirPro ceramic beads. The Cabilux Zirblast series are equipped with specific features like the Flexmatic floor system which is optimized to smoothly transfer the media. ZirPro ceramic beads B sixty and B one-hundred-twenty are easy to use in a Cabilux blasting room. We are going to see the outstanding results to treat the surface of stainless steel equipment. The projection of Zirblast ceramic beads delivers a powerful and focused stream of blasting media. Scratches & grinding marks are effectively removed. Welding rims are perfectly cleaned without contamination. The uniform impacts of fine ceramic beads create an extremely smooth and aesthetical satin finish on the stainless steel surfaces. The longevity of Zirblast ceramic beads ensures a very stable process and consistent blasting results from part to part. The ZirPro ceramic beads enable to achieve a wide range of satin finishes, specific to our customers’ requirements. Using Saint-Gobain ZirPro ceramic beads with SciTeeX Cabilux Zirblast series, provides easy blasting operations and outstanding results for the cleaning and finishing of stainless steel and many other metallic surfaces. Saint-Gobain ZirPro’s Zirblast® ceramic beads are used as blasting media for blast cleaning and surface preparation applications. Zirblast beads are durable blasting media that offer effective cleaning power with no surface contamination to deliver a smooth satin finish. They are suitable for blasting the surface of all kinds of steel, aluminum and other non-ferrous alloys to remove oxide, rust, sand, coatings and burrs. Zirblast cleans many industrial parts such as molds and dies, engine parts, turbine machinery components, welded steel components, forged and casted metals. The Zirblast range also is used for surface finishing applications when a satin metallic surface is required with higher roughness than Microblast® treatments.